We have just made it super flexible for the Trekking Community looking to venture deeper and higher in the Sankri range in Uttrakhand. Now you can rent almost any trekking and mountaineering equipment from Sankri. From light weight cheap gas stove solutions to sleeping bags, tents, Kitchen tents, toilet tent, gaiters, crampons, ponchos etc. Safety gears like oxygen cylinders, pulse oxymeter, etc. We've covered it all.. Now you can just come down to Sankri, arrange your trek by yourself and get it done in style.. Your way..
That will definitely hone and nurture the Team Leader in you. Check below the list of camping and other important trekking and mountaineering equipment available with us for rent. Click and Book First !! Our #Equipment_Rental_Portal is now Online. Now you can booking your #TrekEssentials directly on the website. It is open for our private trekkers as well as independent trekkers, or trekkers of other groups. From the beginning of Himalayan High, we had started to rent trek gears to help out the trekking team to save some cost and also leave the hassle of choosing best gears to us. Initially it was limited to our Private Groups only and slowly we opened up to independent trekkers and trekkers of other groups. Now we have got it online for multiple locations across the Himalayas. Soon, all the locations will be an active delivery locations for good quality, well maintained equipment on rent. Currently, only Sankri and Maneybhanjyang are active locations. We rent out the equipments from our Homestay in Saud - Sankri. 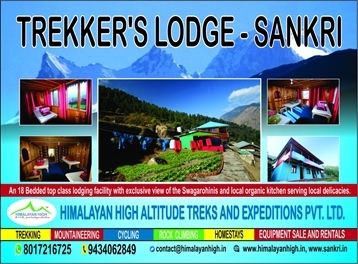 Ask anyone for Himalayan High Trekker's Lodge in Saud, which is right on the Taluka road, little ahead of the trek starting point for Kedarkantha trail. Here is the photo of our Trekkers Lodge in Sankri.